A Devon animal charity says it dealt with a large influx of animals over the Christmas period. The North Devon Animal Ambulance, which is based in Barnstaple, experienced a variety of cases, from abandoned dogs and cats, to rabbits and budgies. 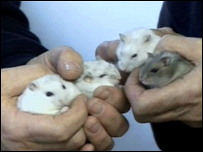 Other recent arrivals include four hamsters found in a plastic tub put outside for the rubbish collection. The charity's spokeswoman Diana Lewis said pet owners had to realise that animals were not disposable. Although the animal ambulance was only founded in 2003, Diana Lewis said it was the worst Christmas she had seen in 18 years of working with animals. She said: "It's the worst I've ever experienced. "There's been 13 dogs in the couple of weeks in the run-up to Christmas, and the cattery was full so that we had three cats to a pen at one point." She said the charity felt that people could not commit to their pets. She said: "An animal really is a long-term commitment. You don't just get it and when you go on holiday discard it. "We're living, it seems, in a throwaway society." In one case, a pair of budgies were brought in because the owner said their child had simply grown out of them. At the moment, the charity says it spends about £3,500 a month on vet's bills. In 2007, it managed to re-home 127 cats and 83 dogs.